The ongoing effort to absolve Steve Bartman of his historic Cubbie sin protests too much, in the way that the person who keeps getting louder during an argument is usually the person who is losing - or subconsciously trying to convince themselves in the first place. We all saw what happened that fateful night in Wrigley Field, and we all reacted just like Moises Alou did. We knew what it meant. Bartman took away an out from a Cubs team that was actually closing in on a World Series appearance. And he did so in a manner that seemed to epitomize the ineptness of the franchise. The team didn't have to fall apart in the aftermath, but under the weight of Cubs history, they did just that. Richard Roeper (link dead) and Rick Morrissey (link dead) want you to believe that Steve Bartman was not to blame for the Cubs collapse in Game 6 of the 2003 NLCS against the Marlins. They are among that ilk who like to blame everything that happened after the Bartman incident - Mark Prior's meltdown (a walk, a wild pitch, a single), Alex Gonzalez's error on a double-play ball (not Alex Rodriguez as Roeper writes today, but there for the grace of God . . . ), and even Kerry Wood's choke in Game 7. I'm sorry, and I don't want to be mean, and I can't imagine what it is like to be Steve Bartman, but everything changed after he got in Moises Alou's way trying to catch that ball. To blame everything that happened after that is to blame the effects but not the cause. In the bar where I was watching the game - the Beachwood, natch - an instant foreboding filled what had been a celebratory air. Even before the next pitch we were screaming "The Curse! The Curse!" It wasn't much different at the ballpark. A gloom descended; the Heavens shifted. I'm not sure if dark clouds suddenly appeared overhead, but they may as well have. The fans felt it and, more importantly, the players felt it. Hence Prior's sudden wildness - and Gonzalez's need to rush a double-play attempt instead of just having to get one. We don't like to face that fact because it seems so lacking in compassion. But that doesn't make it less true. The coverage this week of the 10th anniversary of that game seems designed mostly for members of the media to distance themselves from . . . the media. "It wasn't his fault! It wasn't his fault!" they scream, even while inviting you to watch the video again and again. They aren't running and re-running video of Gonzalez's error or Prior's sudden ineffectiveness. Take David Kaplan, on Sports Talk Live: "He's not the reason they didn't win. It's revolting!" Then he plugged his 5 Outs documentary for the umpeenth time. See, the Cubs were five outs away from the World Series when the Bartman play happened. And then it all fell apart. But it's not his fault! Le'ts face it, if Bartman's foul-ball fiasco wasn't the beginning of the end, they would have called their little movie 4 Outs or 3 Outs. Kaplan also says Bartman "was done in by the machine, by the media," adding that "The more we talk about him, the more forgiving he has to do." Let me tell you something: Nobody has talked more about Bartman this week than David Kaplan. And journalists lauding Bartman for never granting an interview? That is surely Bartman's right, but there isn't anything inherently noble about it. "Over the years, [Bartman] has turned down all interview requests," Morrissey writes. "Good for him." So if Bartman called up Morrissey today and said he wanted to talk, Morrissey would decline? In fact, by keeping quiet Bartman has only intensified the mystique surrounding the whole situation, instead of owning his fluky role in history. I understand Bartman may simply want his privacy. I understand he may still fear for his safety. Again, it is his right to remain silent. It's also clear by now that a city feels deeply for him. Collectively, we all just want to give him a hug. But that just doesn't change the fact that he made a big boo-boo. Steve Stone said on Sports Talk Live on Monday that Alou "overreacted for many reasons, I won't go into many of them . . . "
Why not? What could those reasons be? Was he experiencing 'roid rage? Please tell. Anybody in that seat at that moment does the same thing. 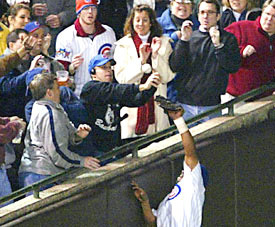 People say that, just as they argue that others around Bartman also went for the ball. But they didn't. One guy looked like he was going to - and pulled away. This play happens at ballparks all the time and quite often fans get out of the way. The more knowledgable fans - like Bartman - know to not intefere with your own team! It would have been different, obviously, if it was a Marlin player there. Then, go for it. Now, in the heat of the moment, do people make the same mistake as Bartman? Sometimes they do. And sometimes they don't. But to just say everyone would have done the same is simply not true, and disproven over and over and over at the ballpark, many, many, many times a season. Coffey replies: OK, it's just me then. I've been to hundreds of ballgames, from major league playoff games to Little League, in dozens of ballparks throughout the country. I've never come close to grabbing a foul ball (or please Lord someday a home run ball). When I get my chance, and I will, as surely as the Cubs will win a WS in my lifetime, you better hope you're not in my way. I'll knock down little kids and push grandma down the aisle, whatever it takes. When I get bleacher tickets for Wrigley, I bring a ringer ball just in case I need to throw one back. I don't care if it's a Cardinal's homer or not, I want a damn ball. I think I've earned it after 47 unfulfilling years as a Cubs fan. I think Bartman's legacy is part of the reason you can write that "knowledgeable fans . . . .know not to interfere." I think Bartman's experience is a cautionary tale. Nobody wants to be that guy again. You can blame the weather as much as Bartman. If the wind was just a little stronger . . . somebody else would have gone for that ball, maybe Alou even catches it, we'll never know. The kid that reached over the wall and gave the Yankees a win is a celebrity in NY. Bartman is a recluse, a punchline, a scapegoat for a bad team that overachieved.